Welcome back, Arrowheads! 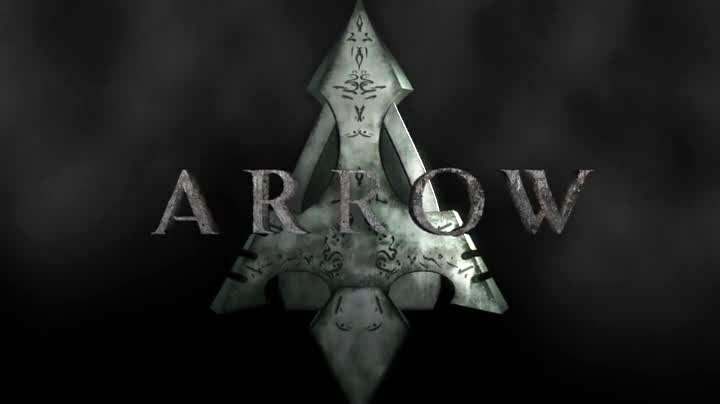 Last we left Team Arrow, Ollie got offered the President of the League of Assassins job by Ra’s al Ghul. He turned it down, but Ra’s is making certain Ollie’s going to take the job, staging fake Arrow-centric killings or not. Ra’s daughter Nyssa is also taking care of business, by training Laurel to be less of a sloppy fighter. But hey, right now Ollie has to get his tux cleaned off, because he has to be the best man at Diggle’s (second) wedding to Lyla! Nowhere Like Home. Floyd Lawton, aka Deadshot, wasn’t always like he was. As we see in the flashback this episode, he came back from a tour of duty to his wife and daughter, only to have problems that certain soldiers have when transitioning back into the world. He tries to be there at home, but is haunted by what he’s been through. Eventually he ends up in jail, a restraining order against him filed by his wife, and then he receives a visitor. A woman bringing an offer to be released, and his deadly talents be put to use. Considering his options, he finally asks what’s the job. It’s a hit on a familiar face to us: John Diggle’s brother. Wedding Reception. Its the big wedding day for Diggle and Lyla, and Ollie arrives in time to hear he missed getting into the wedding photos. Also, the guy meant to officiate the wedding has been delayed, but hey, wedding guest Ray is a minister (you know, because he can do everything), so the wedding is on. After the ceremony, everyone’s dancing and socializing, and Team Arrow gets an alert on some recent Arrow activity…like him brutally killing some criminals! Later at Arrow HQ, everyone is watching the news as Ray is there, vowing to bring the Arrow to justice. Since its obvious who’s behind this, Ollie asks for the team to start running down leads, and Diggle to…go on his honeymoon with Lyla. Hey, he figures someone should have a good day out of this, right? 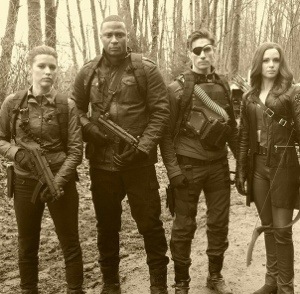 That memo didn’t get to one place, as Diggle and Lyla get into their limo to see Deadshot waiting there. I suppose he has a wedding present? Change of Honeymoon Plans. At ARGUS, Waller is welcoming the couple and informing Lyla she’s needed for a job. A U.S. Senator, Cray, has been taken hostage in a foreign land and its up to the Suicide Squad to retrieve him. Technically it’s the Suicide Duo, being Headshot and Arrow-obsessed Cupid, but Lyla and willing tag-along Diggle makes four. Oh, and their baby Sara? Fine, I guess. Fighting Yourself. Back at home, Felicity has a lead for Ollie to follow, since this faux-Arrow is targeting criminals. Sure enough, at this big criminal convo, the faux-Arrow shows up and starts corpsing people, and the real Arrow comes in to break things up. Of course, there’s several League assassins in Arrow gear, and Maseo’s there to remind Ollie that this will keep going if he doesn’t accept Ra’s offer. After the faux-Arrows leave, Ray in his ATOM gear flys by, does some facial recognition techno stuff, and figures out Ollie is the Arrow! Not Quite A Hostage Extraction. The Squad is prepping to enter the hospital with the senator and the hostages, and Deadshot is trying to pass along his cynical view on relationships to the newly married duo while Cupid is imagining her Arrow marriage. Anyhoo, the Squad busts into the room with the hostages, and takes out the hostage-takers in there. For some reason, the Senator is really bothered by this and pulls a gun on them. He ends up wounding Deadshot, more goons show up, and the Squad falls back. Well, Senator Cray-Cray has staged this whole hostage thing to bolster a campaign for him becoming President, because, clearly he’s Cray-Cray. The Starling City ROTC Club group photo. A Bit of Theater. As Deadshot is getting a bullet pulled out of him, they discover Cray-Cray is going to scrub the whole thing by blowing up the hospital and the hostages. Well, everyone but Deadshot attacks the Senator’s goons, and Cray-Cray threatens to blow the place up and die with it, because once again, Cray-Cray. But Deadshot assists with some sniper work, the Senator flees, and the Squad gets the hostages away. But the place is still about to explode, and Deadshot can’t get out in time, but he’s kinda cool with that as the hospital goes up in flames. And just when Cupid was getting to get obsessed with him. 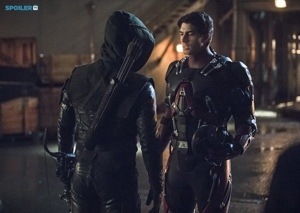 Arrow vs. ATOM. Ray decides to go the police and bring his knowledge of Ollie’s pastime with him, but Laurel is there waiving away his rather vague evidence. He of course, has put together if Ollie’s the Arrow, she must be the Black Canary. We get it, you’re smart, Ray. Trying a less forceful approach, Ollie visits Ray’s office to say his innocence, but clearly he doesn’t trust him. So, Ray fakes a 911 call to get Ollie and Roy into the open, and confronts them in his ATOM suit. He does really well against the duo, but Ollie is smart enough to see how to disable the suit by knocking out its power supply (not so smart to mask your power supply, are you, smarty-pants Ray?). Ray thinks this is going to end with him dead, but Ollie makes clear that if he doesn’t trust him, he should trust Felicity’s judgment. So, I guess Ray’s cool with that. Escalation. At the Diggle home, we get to hear Deadshot taking the fall for the whole hostage situation, and that Senator Cray-Cray bought out the hostages, so no jail time in his current future (because, surrrrrre). Dig lets Lyla know that talk with Deadshot about work and relationships not mixing convinced him he’s leaving Team Arrow. She tells him not to do that, but because of ARGUS covering up this whole thing, she’s quitting. Diggle drops by Arrow HQ to discuss things with Ollie (as well as share a toast to Deadshot), and both of them realize they have to stop Ra’s faux-Arrow campaign before it gets to killing people other than criminals. At the mayor’s office, Ray, Felicity, Quentin and Laurel are talking to the mayor about their sides on the hunting Arrow issue (Quentin’s the only one for it now). Before we can get a final word on it, the mayor gets hit with an arrow, specifically Maseo dressed up as faux-Arrow’s arrow! And he trains his bow onto Felicity! Oh hells no! –Comic book connections: Meltzer Power Plant is probably a reference to writer Brad Meltzer, who worked on DC’s pivotal Identity Crisis miniseries, along with the Green Arrow book itself. –So, do we really believe Deadshot’s dead? If he survived, he’d have to carve that explosive device out of him if he went into hiding. Just saying, Arrow writers, getting out of that will take some ‘splaining. –We get another reference to HIVE, which is the first since the opening of last season. We really need to get back to that soon. –Looks like Bronze Tiger got a promotion in the Squad (wherever he is…)! So Ray was able to piece together Laurel’s secret identity based on her past training partner and that she was wearing a hand cast during their meeting? Bit of a stretch there, dude. Also, you really think some bizarrely angled secret camera footage and a sworn statement is going to make your case against Ollie? –Oh man, we’re not going to hear the last of Senator Cray-Cray, are we?